The Boy, as you know, has challenged me to feed us both for $30 AUD each for a week. I thought I should let you all know how I’m going to work this. Firstly, let’s backtrack a bit. 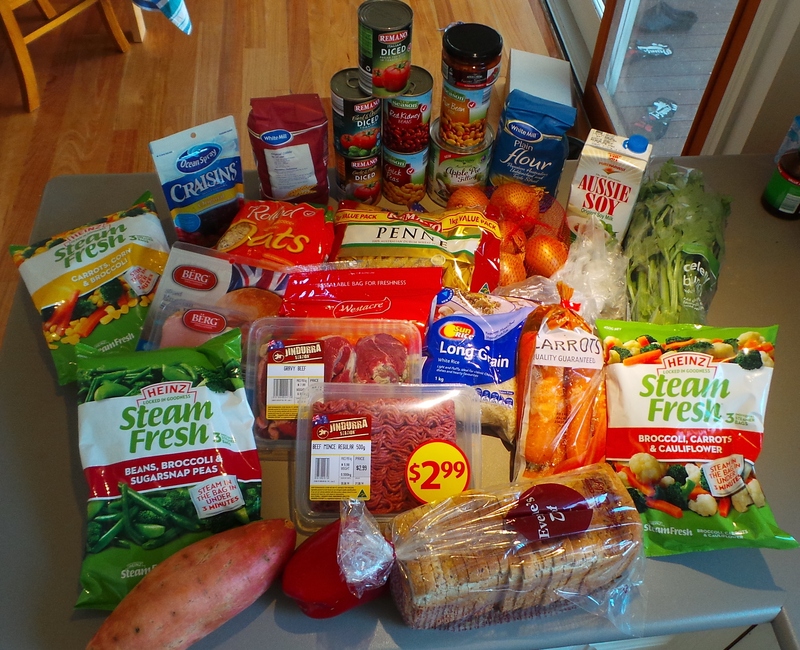 Now food here may be more or less expensive than in other nations, but it’s what I’m dealing with and I make no apologies if you are unable to buy the same things for the same amount of money where you are. It’s just the way it is. I will be buying the ‘big ticket items’ with my total budget of $60. So canned goods, meat, vegetables, bread and dairy will all come from this generous bucket of cash. I will not however, be including pantry items that I may use only a sprinkle or tablespoon of while preparing these things. In other words, two tablespoons of golden syrup in a recipe does not justify buying a whole new bottle of the stuff, neither does a sprinkle of mixed herbs. Spreads for our breads are already in our refrigerator. I buy a tub of butter/margarine maybe once every 6 weeks, I’m not including those in our budget – bread will be. The money will not be used to purchase anything other than food for us. Our cats, our household cleaning needs and loo paper will not be part of this challenge. I will be posting lists of goods, where I bought them and the price I paid in future posts. I promise. But here’s a pic to tide you over. The groceries I bought to feed us for that $30 each this week. I will also post a daily diary of what was prepared and consumed on each of the seven days. And there will be a record of anything that may be left over at the end of the week too. I hope you find this an interesting ride!